We’d love your help. 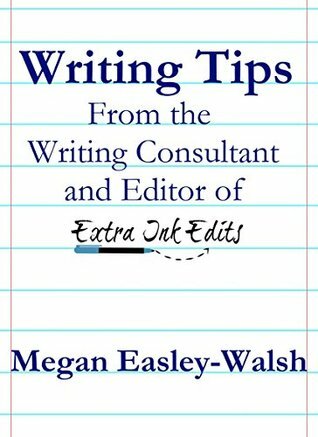 Let us know what’s wrong with this preview of Writing Tips by Megan Easley-Walsh. Become a better writer today! Whether you write fiction already, or would like to begin, this guide is full of helpful tips from an author, writing consultant, editor, and former college writing teacher. Divided into twelve chapters, topics covered include everything from how to avoid plot holes to how to write the perfect query letter. Tips on overcoming writer’s block, fi Become a better writer today! To ask other readers questions about Writing Tips, please sign up. Megan Easley-Walsh is a bestselling author of historical fiction, a researcher, and a writing consultant and editor at www.ExtraInkEdits.com. She is an award-winning writer and has taught college writing in the UNESCO literature city of Dublin, Ireland. Her degrees are in history-focused International Relations. She is American and lives in Ireland with her Irish husband.